If you are creating project for the first time in the Enterprise Dashboard you will first have to invite users to collaborate and create a Group with one or several Group and Project Managers. Depending on whether you are new on HoloBuilder or already have multiple of your colleagues using the platform, the set-up differs as distinguished below. If you have co-workers that already have a HoloBuilder account, be it active or inactive, we will add these users to your company during the company set up. Simply provide us with a list of the co-workers with an existing HoloBuilder account as well as the desired role each should have and we will add these users to your company for you. For each user that should be transferred, please also add the connected HoloBuilder projects with assigned Group and Project Manager. When transferring a co-workers account to your Enterprise Account, you can decide which projects should become transferred to the Enterprise Dashboard and which will stay with the co-worker’s account. Please note, that all transferred users will not have a subscription of their own anymore once added to the Enterprise Dashboard. This means, that all projects of this co-worker account not transferred to your Enterprise Dashboard will become inactive and uneditable. Whenever you create a new Project you must assign it to a Group and a Group Manager. Therefore it is recommended to invite your Project Manager(s) and all other colleagues that will work on the project before creating the project itself. Of course you can always edit the project later on and add or remove collaborators, as well as adjust their roles. You can add new users to your account with the corresponding access permissions in the User Directory. Click on User Directory in the panel on the left to get access. Select Role ‘Group Manager’. Enter an email address and specify the available number of square feet this Group Manager will have available. Optional: Check ‘Invite another’ to directly get the option to add another user to your team. Invite any other internal or external team members and assign the roles accordingly for Group Managers, Project Managers, Enterprise Viewers, or no role at all. You must at least assign one Group Manager. Each time you invite a new user, first select their role, enter their email address in the box provided, and, depending on the role, you may be asked to add more information. Once your information has been correctly entered into the form, you may click “Invite” to invite the corresponding user. For future projects, you can then use the user group you created for this project and invite them as a whole. This way you save time and do not have to repeat the inviting process for each new project. Learn how to invite an existing user group to a project here. Once you have created a Group that includes the colleagues you want to include on the project you can start creating a new project with your Enterprise Account. The project creation form contains six fields for information to be entered into, all of which, except for ‘Client Name’, are required. In the ‘Project Area’ field, enter the number that represents the area of your project in square feet. This will specify how much area this specific project is taking up from the entire available area. Please note that you need to assign at least one Group Manager from that Group to the project. Simply enter the email addresses of the desired users to assign them to this project or select the corresponding user from the drop-down menu. 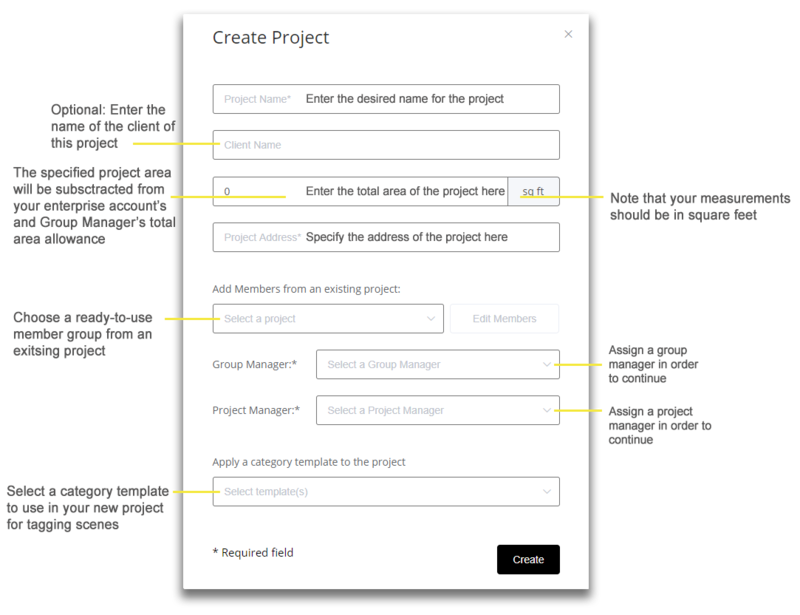 Additionally, for new project creation in general, you can choose an existing team from another project to add as members of the new project. Learn how to add an existing team here. Also, you can add pre-designed category templates to your new projects for direct project tagging. Learn more about how to use category templates in the Enterprise Dashboard company-wide here. Once your Enterprise Dashboard was set up by transferring existing users and projects or starting a new, you can extend your team indefinitely. Any defined roles or assigned square feet of users can be changed at any time. You can add new users to your account in the User Directory. Click on ‘User Directory’ in the left-hand side panel to open the general user overview. Select a role (or ‘No role’). Enter an email address and submit the required additional information below. All invited users will receive an automated email with a link to the project. It is possible to invite users with as well as without existing HoloBuilder account. Any invited users without existing HoloBuilder account and an assigned role (other than ‘No role’) will have to sign up to HoloBuilder in order to get access. A sign-up link will be provided in their invitation email in addition to the project link. Give other users the permission to work with you on this project to really start collaborating. To do this, click on the project that you just created to open up a panel that shows you more details about your project. Click on the text bar to open a drop-down with all available users to select from or start typing the user’s name or email address. For each user that you invite to this project, you must also specify whether that user is a Project Admin, Project Viewer, or Project Editor. Once you enter the email address of the desired user and choose the appropriate role for them, click “Invite” to add this user to the project in the capacity in which you have chosen. You can change the role again anytime. Please note that Project Admins have the same rights as the Project Manager and will also be allowed to invite new users to a project, whereas Project Editors can only work on the content of the project. Project Viewers have no editing permissions at all.